After the occupation of Norway, German soldiers were encouraged to form relationships with the country’s women (left) but when the war ended, the girls face bitter retribution by their fellow countrymen (right). In A Dangerous Act of Kindness, Millie Sanger discovers that you can’t always help who you fall in love with. During the Second World War, thousands of Norwegian women faced the same moral dilemma. Nearly eighty years ago this month, the Royal Navy took on the Kriegsmarine at Narvik. A month earlier, Hitler had ordered the invasion of Norway but during this first naval battle, Germany lost two destroyers and retired when the third was badly damaged. 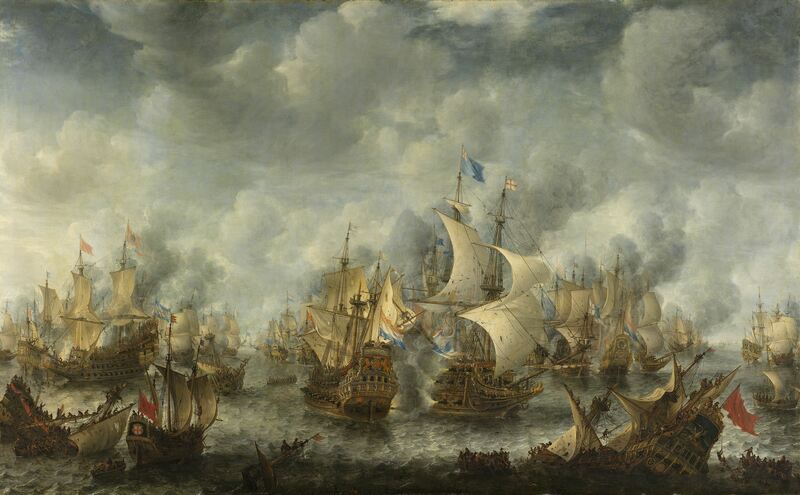 The naval commanders on both sides were killed in the battle. More determined than ever to defeat the Germans, a new wave of forces arrived in the Ofotfijord on 13 April 1940. Three German destroyers were sunk and the German crews scuttling many of their own ships when they ran out of fuel. These two battles halved the destroyer strength of the Kriegsmarine. Despite these early victories, the Allies were forced to withdraw their defence of the country when France fell. Norway was occupied by Germany. SS leader Heinrich Himmler approved of Norwegian women. They epitomised many of the desired attributes of the Aryan master race and occupying soldiers were encouraged to have children with them. It’s thought that 50,000 women had relationships with German soldiers. These so called ‘German Girls’ faced bitter reprisals when the war ended and they were accused of betraying their country. The real Brigsie Paterson was a wartime friend of my mother’s. She wasn’t a Land Girl, she was a VAD. I remember her as a strong and independent woman. When I was creating Brigsie for A Dangerous Act of Kindness, hers was the face I had in mind. The real Brigsie didn’t have a secret like the one in my book. My Mum met her at Boyce Barracks where they were both being trained to serve overseas. They instantly clicked and stayed chums all through the war and for the rest of their lives. When they were out in Graz, Brigsie fell in love with a doctor called Mike Sutton. He was in charge of the Blood Transfusion Service and was known as ‘Blood Sutton’. They shared a love of riding. One Christmas, Mike rode his horse through the hospital, blasting away on his hunting horn to wish Brigsie a very Happy Christmas. Unfortunately for Brigsie, Mike had a wife waiting at home. One evening in Graz, my Mum was in her bedroom and she heard a hunting horn playing Gone Away. She rushed off to find Brigsie and said, ‘Isn’t that Mike out there at the edge of the forest?’ Brigsie said, ‘Yes. He’s playing Gone Away. It means he’s leaving.’ He was demobbed the next day and she never saw him again. Brigsie didn’t marry. After the war, she found a new life, farming in Limuru, Kenya. In many ways, she became the Land Girl of my story. I rather think my fictional Brigsie would have done the same sort of thing when the war was over. My Mum with Graz and her litter, enjoying the summer on the banks of the River Wye. My mother and father married and settled in Hereford. They named their first boxer dog Graz, after the town where they’d fallen in love. In 1949, Graz had a litter and one of the puppies, Ranee, was sent out to Brigsie. Brigsie out in Limuru, Kenya with Ranee’s litter of seven beautiful boxer dog pups. When Brigsie retired, she came back to England and settled in Southampton. I visited her during the 1980s and remember that her house was filled with exotic pottery and carvings from her time abroad. I wanted to pay homage to her in A Dangerous Act of Kindness as a thank you for all the wonderful stories and wartime adventures that she had with my Mum. During the Middle Ages, the practice of surgery and medicine was carried out by the clergy but at the beginning of twelfth century, Pope Alexander III banned them from performing any procedures that involved blood. As blood-letting remained a popular treatment for a wide range of illnesses, the clergy turned to their barbers. Barbers traditionally worked in the monasteries, keeping the monks clean-shaven at all times, as decreed by Pope Urban II a hundred years earlier. 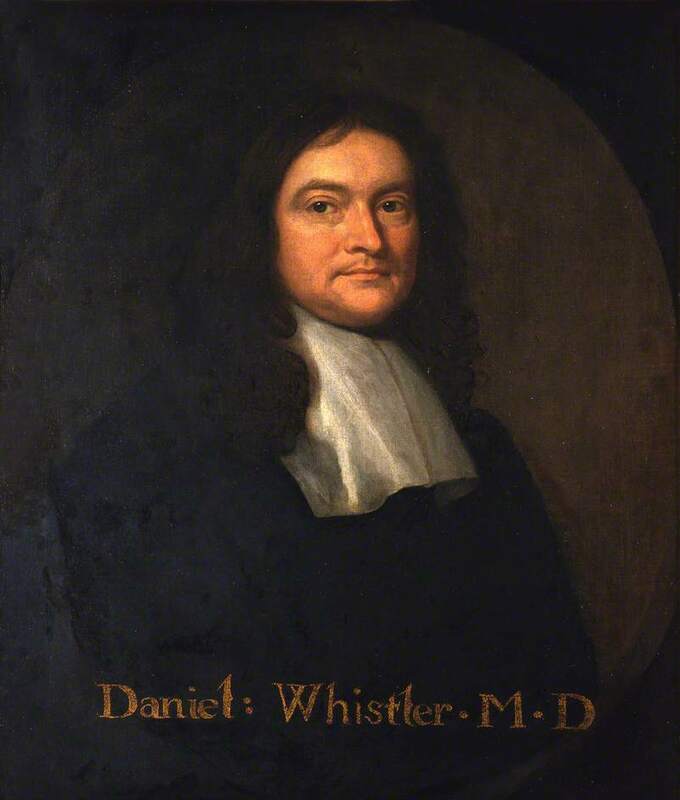 The barber-surgeon provided a range of services such as tooth extraction and minor operations as well as bloodletting. The barber’s pole was originally a symbol of the pole the patient held in their hand during bloodletting, the brass ball at the top of the pole symbolising the bowl used for collecting the blood or for holding leeches. After treatment the bandages were washed and wrapped around the pole to dry, giving it the traditional striped pattern. The Black Plague of the 14th and 15th centuries had a devastating effect on the number of university-trained physicians (with a doctorate) and in 1540, Henry VIII united the Company of the Barbers and the Fellowship of Surgeons with a royal decree, the Company of Barber-Surgeons, to alleviate the shortages. (Even today, a hospital doctor loses his or her ‘Dr’ title and becomes ‘Mr’, ‘Mrs’, ‘Ms’ or ‘Miss’ once he or she has acquired higher surgical qualifications.) 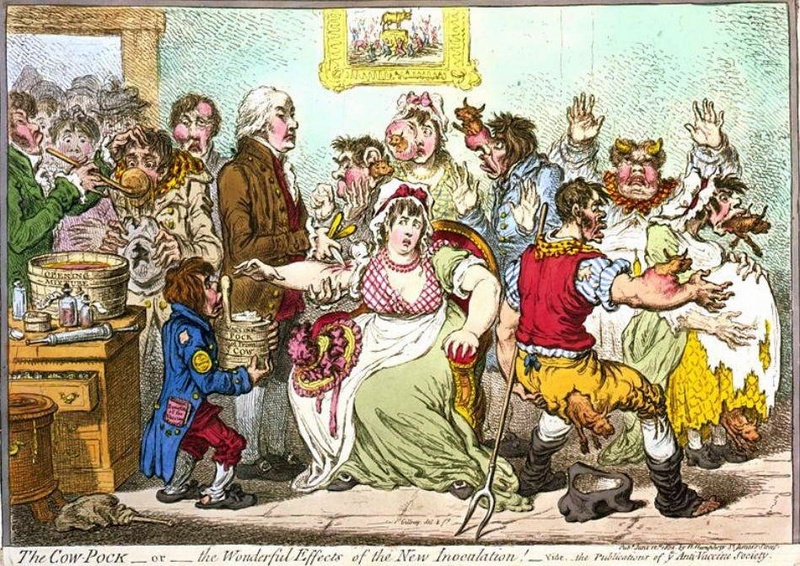 With no formal training, many barber-surgeons resorted to quackery, and discord between the barbers and the surgeons increased, which explains Dr Argyll’s antipathy towards barber-surgeon Mr Barker in The Red and the Scarlet. However, advances in surgery had gradually improved, pioneered by innovators such as Ambroise Paré. Originally apprenticed to a barber, this famous Frenchman served as army surgeon for thirty years, pioneering and inventing a range of procedures, in particular the treatment of war wounds. When his book Les Oeuvres was published in 1575, his ideas spread across Europe and respect for surgeons began to build until, in 1745, the surgeons finally dissolved their centuries-old partnership with the barbers to become the well-respected profession they are today. Throughout my time at Blenheim Palace, I was intrigued that the Battle of Blenheim was overshadowed in English history by the Battle of Waterloo. Not infrequently visitors thought the famous tapestries showed the Duke of Wellington fighting the French whereas they show the Duke of Marlborough fighting the same foe a century earlier. Visitors were far more interested in Winston Churchill (who was born at Blenheim Palace) than in his ancestor, John Churchill who won the ‘glorious victory’ on the fields of Bavaria at the beginning of the eighteenth century. Winston himself tried to set the record straight, believing that John Churchill’s defeat of the armies of Louis XIV in 1704 changed the axis of power in Europe more dramatically than the defeat of Napoleon. Marlborough and Wellington are both regarded as brilliant generals but Wellington always seems to steal the march. 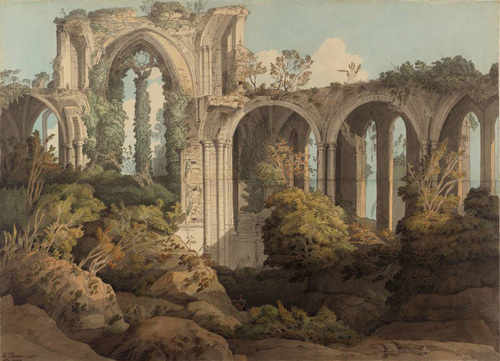 The poet Robert Southey in 1796 wrote an anti-war poem about a skull found by children in the fields of Bavaria, highlighting the pointless human sacrifice. 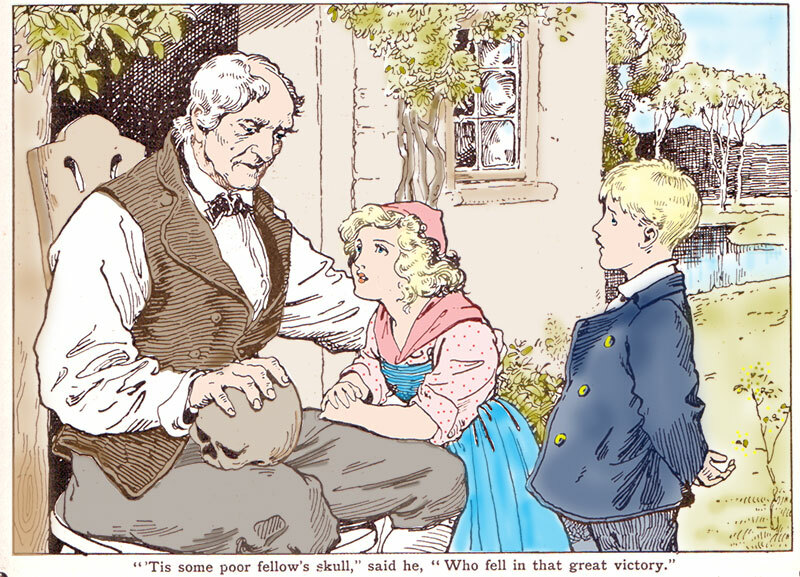 Mawkish Edwardian illustration of Southey’s poem ‘After Blenheim’ from the Children’s Encylopaedia. In fact, the death toll at Blenheim was half that of Waterloo, a battle Southey praised in a later poem written in 1816. And the sacrifice at Blenheim was certainly not in vain. The victory destroyed Europe’s belief in the invincibility of the French, saved Vienna from invasion and stopped the expansionist policies of Louis XIV. In his history of the British army, John Fortescue wrote that Marlborough, like Wellington, ‘was endowed with a strong common sense that in itself amounted to genius’ but thought that ‘there was a bond of humanity between Marlborough and his men that was lacking in Wellington,’ and yet Wellington remains in the national consciousness and Marlborough is all but forgotten. It’s a puzzzle. The two generals shared other attributes: they were both handsome men, although perhaps Wellington’s more contemporary look captures the nation’s imagination better than Marlborough’s (the Brian May wig doesn’t help). Another reason may be that the history curriculum in this country tends not to focus on the early part of the eighteenth century. But my favourite reason was put to me by a visiting historian. He reckoned Waterloo was more famous because it was an easier battlefield for tourists to visit, standing just outside Brussels, and because it had a catchy name that people remembered. 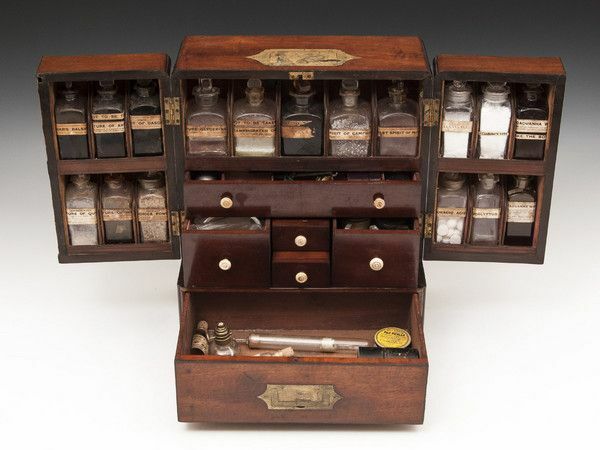 Eighteenth-century physicians carried their medicines in these beautiful boxes. This one is made of mahogany and would very probably have been taken on campaign because it has brass carrying handles. There are double opening doors that lock as well as a secret compartment. When the cabinet was open, it gave access to a clasp on the front right hand side. When this was pulled out, a compartment at the back slid out. It was used for storing poisons. As well as the bottles, the cabinet contained a pestle and mortar, a set of scales made of brass with iron weights, a metal funnel and a measuring tube. The drawer handles were made of ivory. 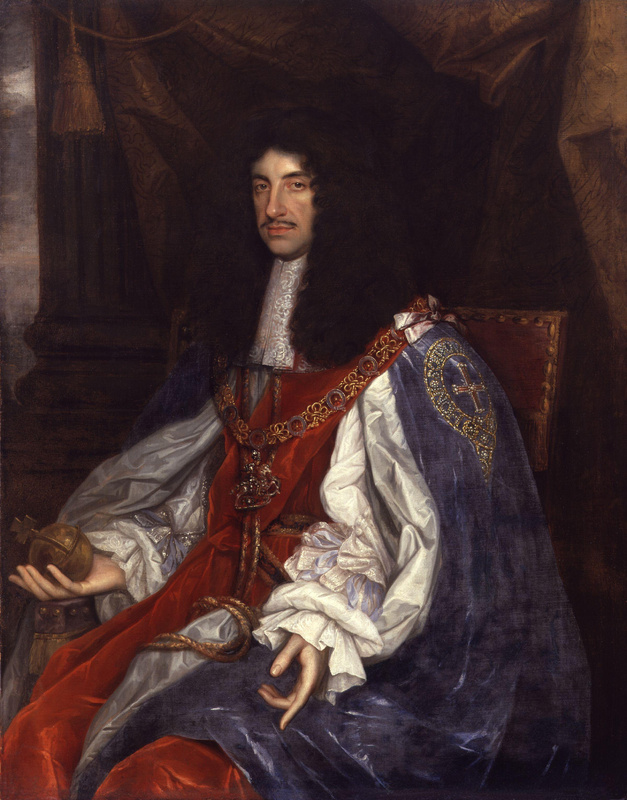 When Charles II of England lay dying from a convulsion which attacked him while shaving, the medicos of that day left no stone unturned in helping him along to the Great Beyond. First, he was bled of a pint of blood. Then his shoulder was cut and eight ounces more of blood was extracted by cupping. Then followed an emetic, a purgative and another purgative. Next, an enema in which they used antimony, sacred bitters, rock salt, mallow leaves, violet, beet root, camomile flowers, fennel seed, linseed, cinnamon, cardamom seed, saffron, cochineal and aloes. This enema was repeated. In two hours, another purgative was given. 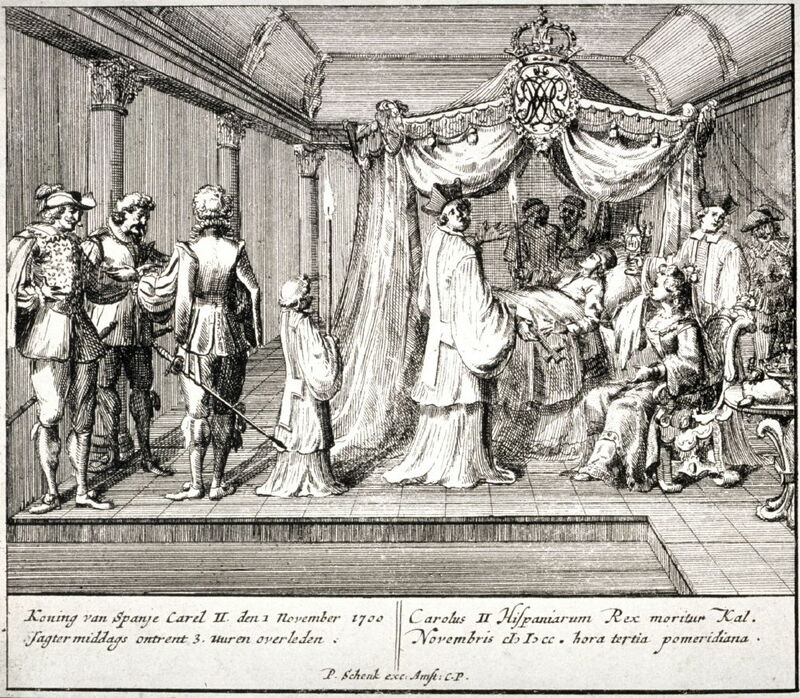 Death of Charles II. At the age of fifty-five, Charles suffered an apoplectic fit while shaving. He died four days later but may well have survived without the medical intervention of the day. The King’s scalp was then shaved, and a blister raised on it. They gave him next sneezing powder of hellebore root; they sought to strengthen his brain by giving him powder of cowslip flowers. Purgatives were frequently repeated. He was given drinks of barley water, licorice, sweet almonds, white wine, absinthe, anise seed, extracts of thistles, rue, mint and angelica. When these did not cure him, they gave him a poultice of burgundy pitch and pigeon dung, to be applied to his feet. More bleeding, more purging; they added melon seeds, manna, slippery elm, black cherry water, extracts of flower of lime, lily of the valley, peony, lavender and dissolved pearls. When these did not do the trick, they went at it with gentian root, nutmeg, quinine and cloves. When this failed, he was given forty drops of extract of human skull. Then they forced down his throat a rallying dose of herbs and animal extracts. Then some powdered bezoar stone. Alas, after an ill fated night His Serene Majesty was so exhausted that all the physicians became despondent. And so, more active cordials, and finally pearl julep [a heart tonic] and ammonia, were forced down the royal patient’s throat. Then he died.